It's Proclamation Day, and schools all around the country have been commemorating one of the single most important documents in all of Irish history. Here at the Cork Life Centre, things were no different! 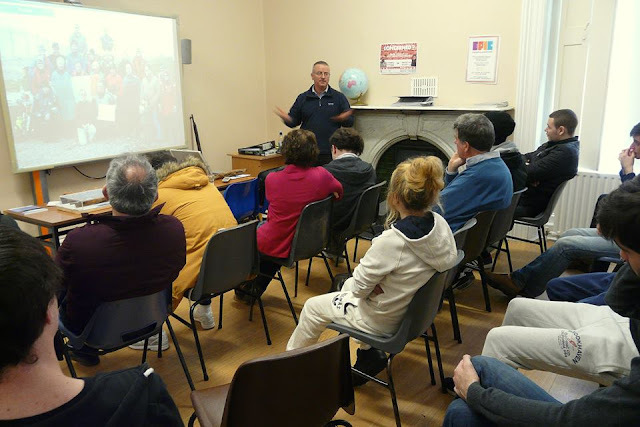 Situated in what used to be the Lord Mayor's house, with a view of the entire city, and an ethos that goes all the way back to the work of Edmund Rice in the 19th century, the Life Centre's staff and students have always been keenly aware of history and more than prepared to celebrate it. We began in September, with students from all years hearing lessons on the lead up to the Rising, the week itself and the aftermath. A small copy of the Proclamation was put up in every classroom, and before the month was even out, some of our students had the opportunity to attend the removal of the remains of Jeremiah O'Donovan Rossa from Collins Barracks. By October we had begun drama workshops in preparation for our performance of Sean O'Casey's The Plough and the Stars in May. The interest in the production has been huge, and as it's come together over the last few months we've seen new talents discovered, explored and developed. 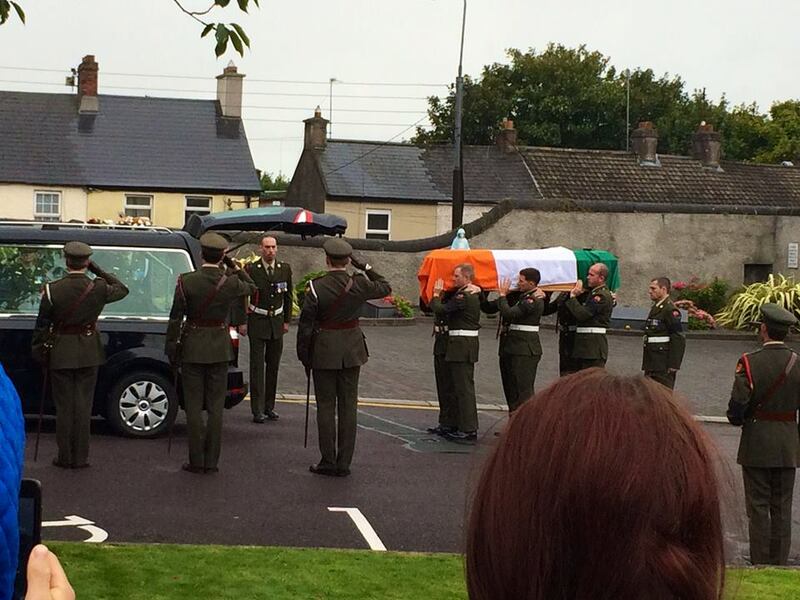 As the cast have gotten to know their characters, they've learned about what the 1916 Rising would have meant for them, and by proxy, very many ordinary people living in Ireland at the time who may not have played an active role in the developments of that week, but whose lives were no less affected. Local historian Philip Johnston visited us and delivered a talk about Roger Casement and his mission on the Aud. 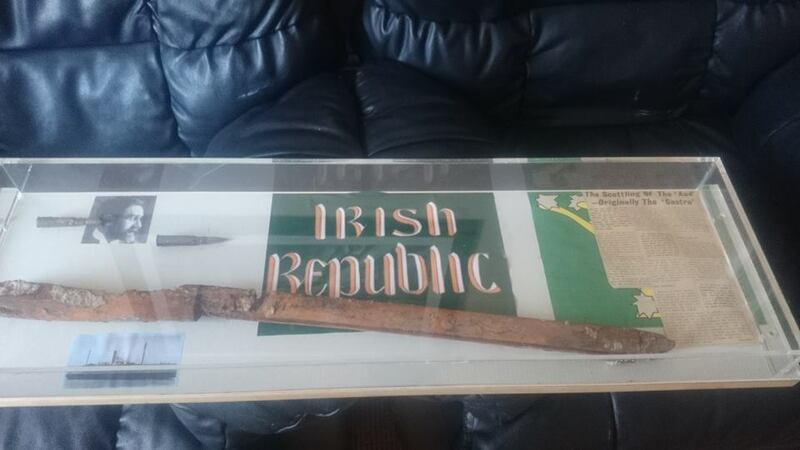 He brought with him some artifacts recovered from the ship's wreckage, and replicas of the kinds of weapons Casement was trying to smuggle for the rebellion. 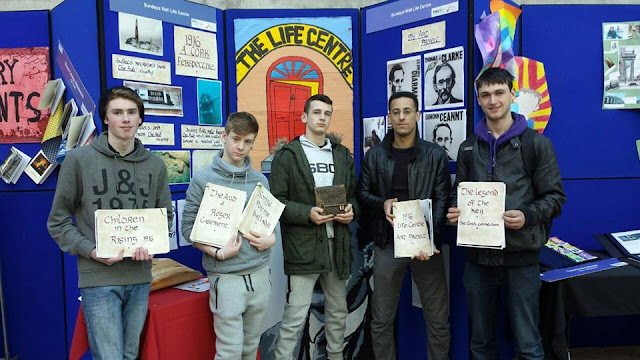 Our students also got involved in the Make A Book project in Cork City Hall, with a book about the Cork City Gaol during the time of the rebellion - we even got a replica of the key! 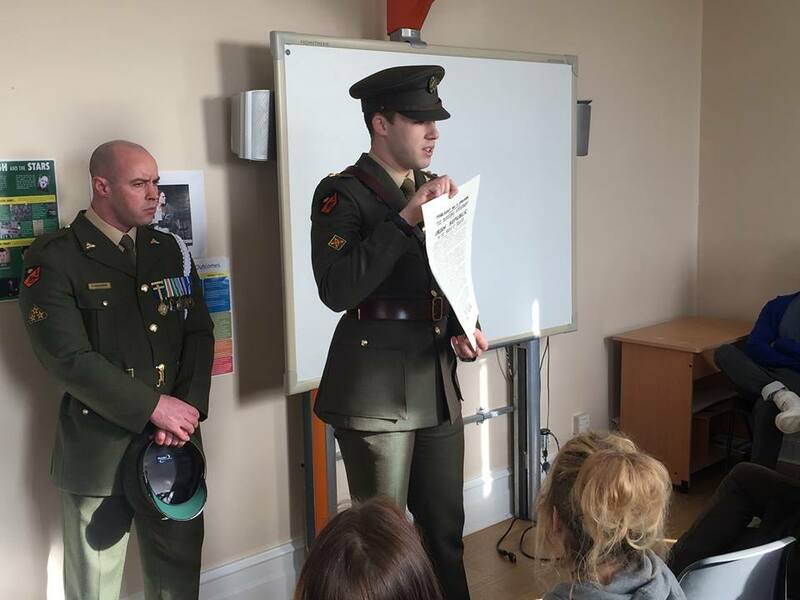 Members of the Defence Forces visited the Life Centre earlier in March and presented us with the national flag, replica copies of the Proclamation, and the lyrics of Amhrán na bhFiann. We were very grateful for the time they gave us, especially considering we have some students interested in joining the Defence Forces themselves. Lieutenant McKeown and Gunner O'Mahony from 1 Brigade Artillery Regiment spent time with our students to answer their questions about how to join and the work that would be involved. Thanks to resources shared on the History Teachers Association of Ireland Facebook page, we've changed our room numbers to names - the seven signatories adorn the doors of our main classrooms. That's not their only presence in the Life Centre, however. For the past few weeks, our students and their Art teachers have been working on huge wooden displays for each of the seven signatories. One by one they appeared on our rails, in the same order in which their names are listed on the Proclamation, until the group was finally complete today. With the signatories on the rails behind us, the entire Life Centre community gathered today to mark Proclamation Day. 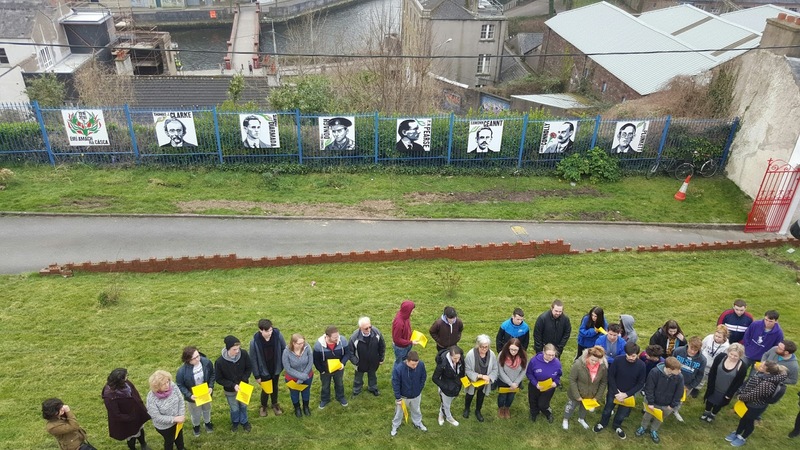 Students and staff read sections of the Proclamation aloud, we raised three flags - the national flag, the flag of the Irish Republic, and the Starry Plough, before singing Amhrán na bhFiann together. The copies we received from the Defence Forces now adorn our classroom walls, and a large replica of the Proclamation now hangs above our staircase, surrounded by several "mini-proclamations - our students and staff have been writing down their hopes for Ireland's future. After all, it's been a hundred years since Pearse, Connolly and the other rebels first read the Proclamation aloud to the people of Ireland. The ideals contained within it are not confined to the past, and the best way we can honour the men and women who fought not just in the Rising, but the entire independence struggle, is by looking to the future of Ireland, and asking ourselves: what we can do to reach those ideals? With the school day ending, everyone has left the building today with a richer sense of what the Proclamation really means, and as the evening sun shines outside, we're all looking to the future of our Centre, our nation, our republic, our Ireland. These celebrations have been possible through the hard work of the entire Centre community, but special thanks must go to Art teachers Helen and Mary, Drama teacher Michael, History teachers Claire and Ken, Construction teacher Brendan, Make-A-Book co-ordinator Sheelin, and all of the staff and students who contributed to the Proclamation display and who took part in today's celebrations. We would also like to say a huge thanks to the members of the Defence Forces who visited us and who invited us to the removal in September.